The market has had a strong beginning to 2019, with the S&P 500 up over 10% year-to-date. Within sectors of the market, there has been significant divergence of performance. Below is a chart that reflects relative performance of the 11 sectors against the S&P 500 since the beginning of the year. 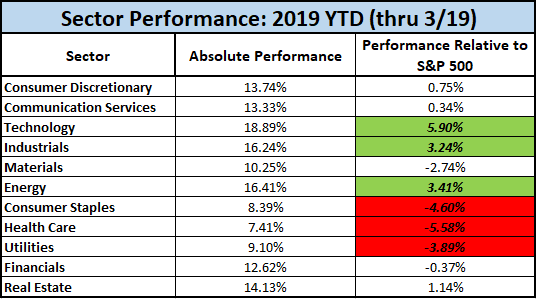 The sectors that have underperformed in 2019 (Consumer Staples, Health Care, and Utilities) were 3 of the 4 best sectors to own during the downturn. 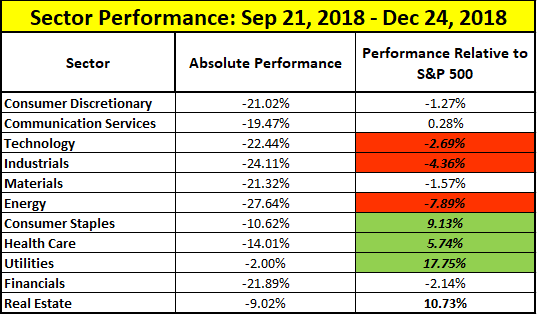 The outperforming sectors of 2019 (Technology, Industrials, and Energy) were 3 of the 4 worst performing sectors during the 2018 downturn. Historically, the sectors that are outperforming in 2019 have been considered more “cyclical” as they tend to benefit from a rising economy. The sectors underperforming so far in 2019 have been traditionally viewed as “defensive” compared to other segments of the economy. This trend has been a reversal of sector performance trends seen at the end of 2018. These types of rotations can happen swiftly and timing these trends can be very difficult to do in practice. 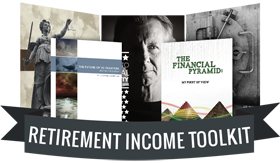 As these two time periods indicate, performance can vary widely within sectors based upon changing investor sentiment. Even with the traditional “defensive” versus “cyclical” definitions, independent drivers of growth (example: manufacturing activity for industrials, rising interest rates for financials) can create different levels of performance. While timing sectors can be challenging, it is important to monitor portfolio positioning within sectors to understand the sensitivity to various drivers of market performance. Lastly, maintaining diversification within sectors creates a risk managed approach that can reduce the overall volatility of the portfolio.